①：Red indicating light corresponds to power switch and green light corresponds to working state indicating light. When it works normally, green light normally blinks. When there is no video input signal, blinking is slow. When any internet port is in hot backup state in this equipment, breathing blinking is shown. ②：Six image input source buttons. There is the indicator light corresponding to input source signal at the bottom. It is blue in default when powered on and it is green after the current channel is selected. It is switched into input source of main picture by pressing input source button for a short time and it is switched into input source of picture in picture by pressing it for a long time. While setting, you can view operation result on the operation screen. As shown in the figure, Main (main picture) is displayed on current operation screen: SDI, PIP (picture in picture): VGA. Input source of current PIP (picture in picture) is VGA input and resolution and field frequency are 1024×768@60Hz. 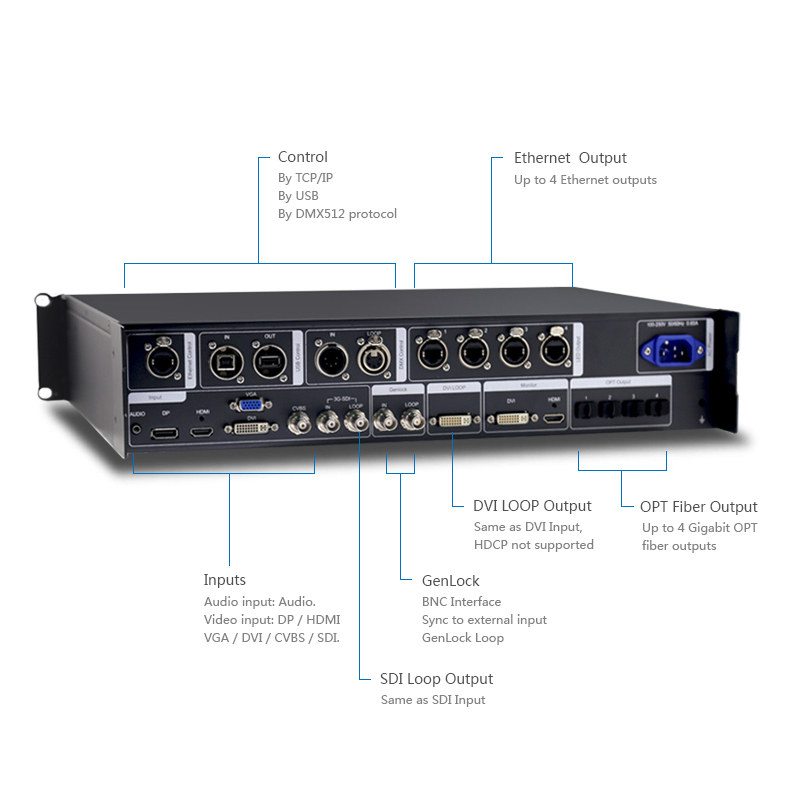 Ø OUTPUT: Resolution and field frequency of current output are 196×256@60Hz; internet port 1 output. : It shows that the current controller is in main control; when Backup is displayed, it is backup. : Current luminance of display screen is 100%. : When current temperature of NovaPro HD exceeds threshold value (can be changed by users), temperature word is displayed in red and blinks. ：When current voltage of NovaPro HD exceeds threshold value (can be changed by users), voltage word is displayed in red and blinks. ：Output picture is enlarged picture. ：Indicating there is GLK synchronous signal input. ：Indicating the controller is not locked. ：Indicating the controller is locked and all buttons on the controller are invalid at this time. Locking: simultaneously press the knob and ESC button for more than three seconds to lock the controller. Unlocking: simultaneously press the knob and ESC button for more than three seconds to unlock the controller. ④：Knob: enter by pressing the knob and select or adjust by turning the knob. ⑤：ESC: Exit current operation or option. ⑦：USB interface, configuration file or updating program can be imported. 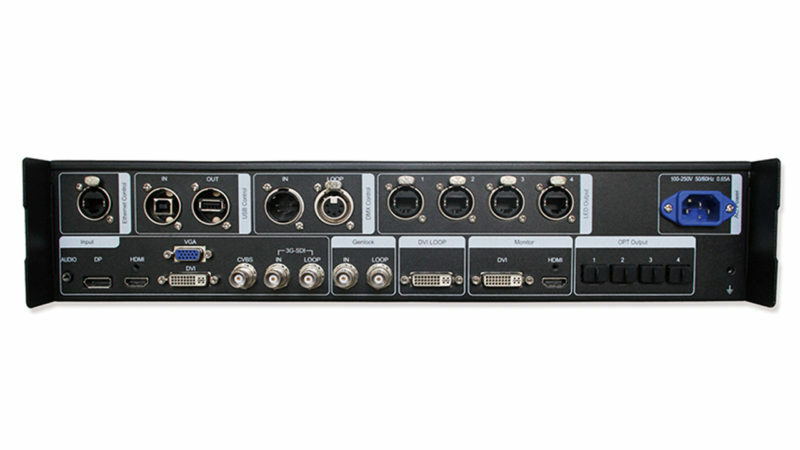 ⑧：USB interface, Connected with PC for communication. 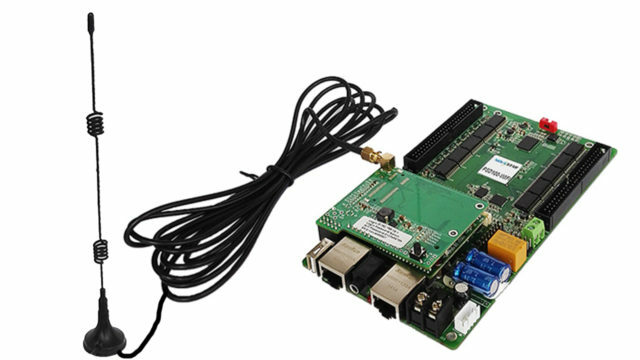 Ethernet: Internet port, Can be connected with PC for communication through standard TCP/IP. USB Control IN: Connected with PC for communication. 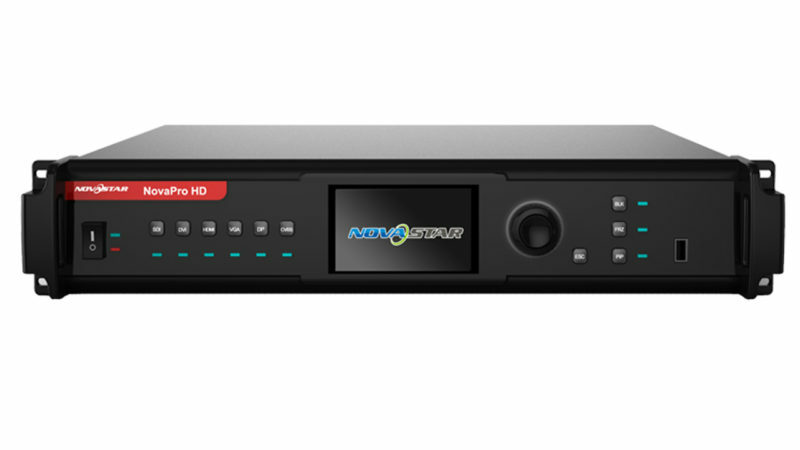 OUT: Cascaded with the next NovaPro HD. 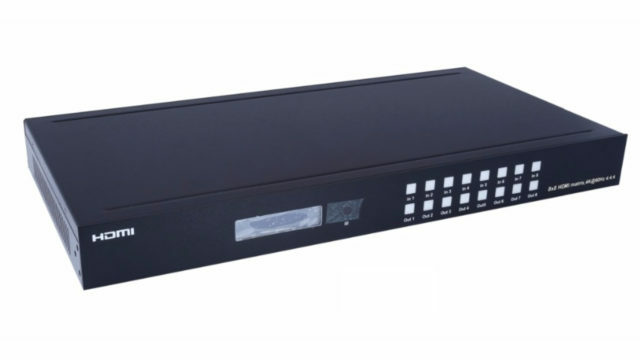 DMX Control: Connect all consoles that support DMX512 interface protocol. 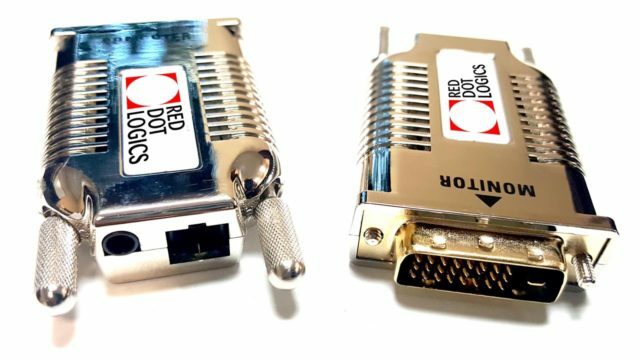 Video input: DP/HDMI/VGA/DVI/ CVBS /SDI. SDI LOOP SDI input signal looping out port. 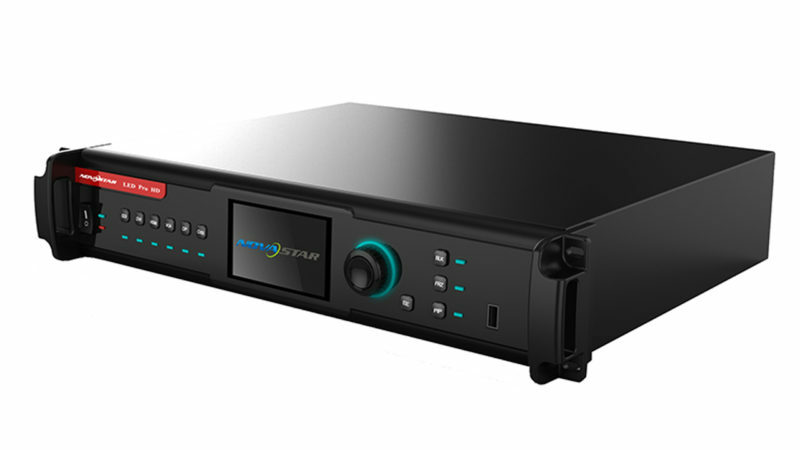 Genlock IN: Genlock synchronizing signal guarantees display picture on big screen is synchronous with external Genlock source. LOOP: Looping out port of Genlock. DVI LOOP DVI input signal looping out port. Montior DVI output, monitor can be connected for monitoring. 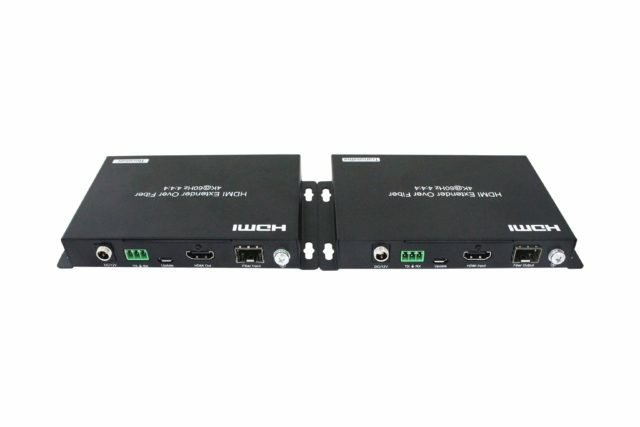 HDMI output , monitor can be connected for monitoring. LED Output: 4-way Internet port output. 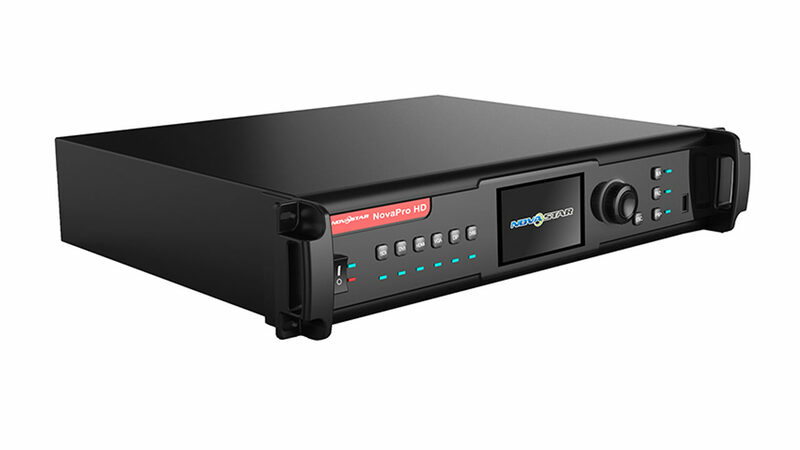 OPT Output: 4-way optical fiber output. AC Power: AC power interface.